Considering the fact that the Glock 43 is one of the most popular concealed carry pistols on the market, you’ll be rest assured knowing that there are absolutely no shortage of holsters for it. The Glock 43 is definitely one of the best concealable pistols on the market. It’s reliable, slim, light, and endlessly customizable. It essentially delivers the same performance you’d expect from a larger Glock 17 or 19 only in a smaller package. Still, if you’re interested into larger models, you could check out our Glock 19 vs. 17 comparison article. If you’re currently looking for an OWB holster for your Glock 43, you’ve come to the right place. We’ll talk about what to look for in a Glock 43 holster and then the top 3 best G43 holsters that you can buy. There are three primary factors that you will want to take into consideration when looking for any holster for your G43. The first quality is, well, quality! Only a high quality and well made holster is going to stand up well over time. The G43 is a pistol that routinely costs over $400, so it makes no sense to buy a cheap $5 holster for it. Go with a higher quality holster, and be willing to pay for it. The next quality to look for is retention. The trigger guard of your G43 must be covered in order to minimize the chance of an accidental discharge, and the pistol also must be kept secure in the holster at all times. The last thing you want is for the G43 to slip out while you’re running, laying down, or whatever. Finally, your Glock 43 holster must be comfortable. This is one of the intrinsic advantages of an OWB holster, which is far more comfortable than say an ankle holster. But some OWB holsters are still more comfortable than others, and if your holster isn’t comfortable, you’re not going to use it, plain and simple. One more thing you may want to look for in an OWB holster is one that is concealable. While many people believe OWB holsters are primarily for open carry, they can also be easily used for concealed carry as well if you have a large enough T-shirt or jacket. This won’t be a concern for you if concealed carry is not something you’re looking for, but if you are, then it’s definitely something that you will want to keep in mind. Alternatively, you might want to check out the best Glock shoulder holster out there. Alien Gear is mostly known for their IWB leather holsters, but they make great OWB holsters as well. Their Cloak Mod Paddle OWB Holster is designed to be concealable under a jacket or large shirt. It features an adjustable cant and retention system, with an open mouth that makes holstering and drawing your weapon very easy. The flex plate, which is made out of steel, ensures that the pistol is retained properly. The holster is not without its cons, however. It can be modified with a belt slide rather than a paddle, but this slide is made out of rubber and is rather flexible, which can cause the holster to slip around on your belt a little. As with all Alien Gear products, you’ll get a 30 day test drive period with a lifetime warranty. If you prefer leather for your holster material, you should give the Azula OWB leather pancake holster a good look. 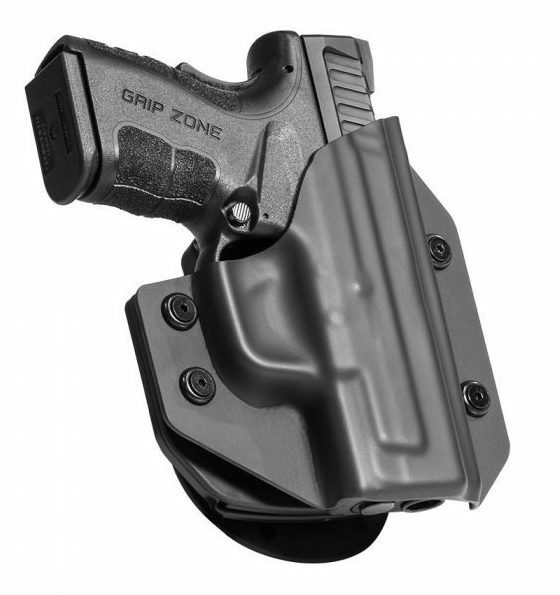 This holster is designed to be concealable while being worn on your belt. This holster is made out of high quality leather and is designed to withstand several years of hard use thanks to a reinforced tab. Even though it is made for the Glock 43 specifically, other 9mm single stack pistols should be able to fit in it as well. 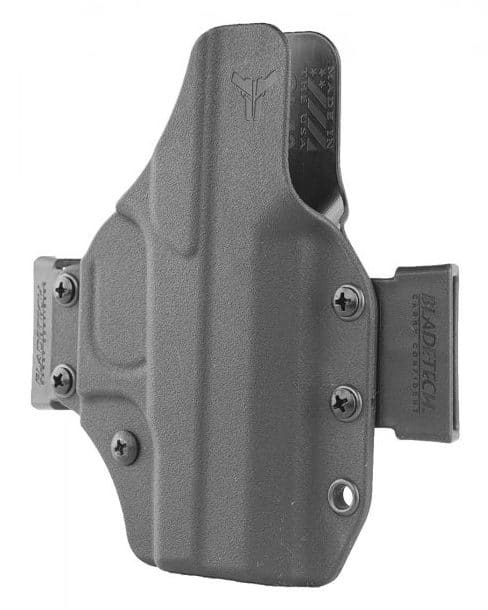 The biggest negative about this holster is the retention is not quite as secure as the other holsters on this list, as there is no specific retention system or snap to keep the holster in place. 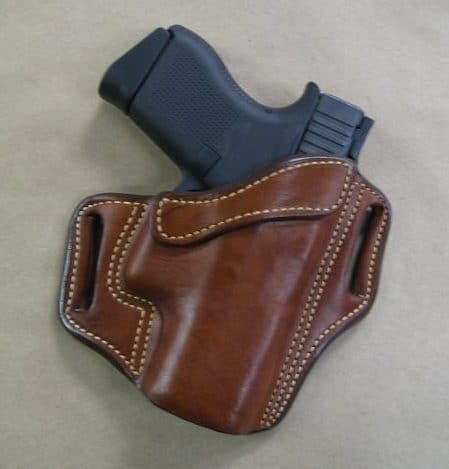 But for a leather OWB holster that you can use for both open and concealed carry, this is a great choice. If you’re looking for an OWB leather holster that’s going to keep tight and high to your body, then the Blade-Tech Industries Total Eclipse holster will be an excellent option for you. This holster is also highly versatile in that it is easy to switch from right handed to left handed carry thanks to a conversion kit, and it can even be switched from OWB to IWB carry if you want. The sweat guard is higher on this holster than others in its class, and as a result it’s not the most comfortable holster on the planet as it can dig into your skin. But for a well made and highly versatile holster that offers you several modes of carry, this holster is one of the best there is. If you’re planning on getting some serious use for your G43, you’re going to need a serious holster. Each of the above OWB holsters are high quality, comfortable, and concealable.